It hissed. It sputtered and spattered. It looked like a time bomb about to explode on the stove. My mother's pressure cooker was a real monster. It turned crisp tasty cabbage to a bitter mush in the blink of an eye. For that reason, I loathed even the idea of pressure cooking, what a terrible waste of food, not to mention the mental energy spent on the raw fear itself! About 6 months ago during a visit to the horse farm in the Auvergne, Isabelle also lugged out another hissing ancient monster and blasted some potatoes to smithereens. This seems to be an international occupation, I noted. It looked like fun, actually. There must be some appeal to this cooking process, aside from saving time. Recently at my favorite store, TATI, a French super closeout store kind of like Big Lots, except for the fact that they also specialize in wedding dresses, I again received a nudge from the pressure cooking god. I was patrolling as usual with Fran, and we came upon a beautiful towering pyramid of stacked pressure cookers on display. "Look, Fran, they aren't monsters." I exclaimed, curiously drawn. Pretty colors, dials and switches, colorful photos of beautiful vegetables, easy clip action, and quotes from scientific studies proving that vegetables retain much more of their precious vitamins when steamed under pressure. I was thoroughly seduced by this song and dance, and brought it up to Loic a few days later. He too had ominous frightening memories associated with the pressure cooker, and was lukewarm on the idea. Besides, it wasn't in the budget. I was thinking primarily of a batch of black beans I had simmered and simmered for ever and ever, wasting away in the heatwave. If I had had a pressure cooker, I wouldn't have had to wait for eternity, nor would I have heated the house like a furnace! Also there was that idea of stress free early suppers instead of midnight meals because of the brown rice situation. We talked about it again, and finally agreed. Yes to the pressure cooker. I felt like a big spender at TATI getting my Cocotte! I had planned it like I had an appointment with myself. I purposefully went around the escalators up to the top floor of Printemps to revel satisfied in their sky high price before heading back to my favorite store. 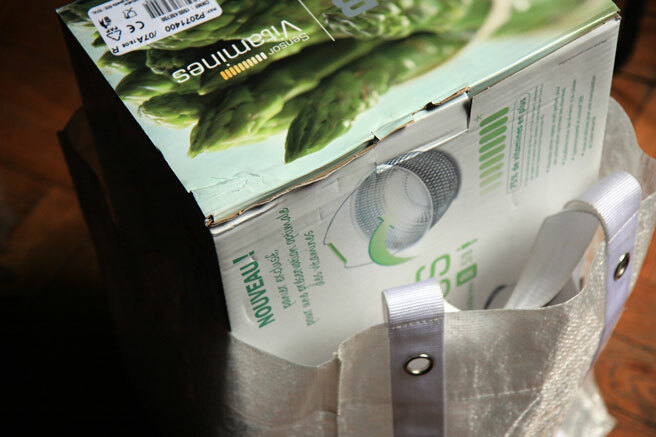 I had chosen the perfect stylish sack from my collection in the front hall closet in which to carry it home, and it peeked out of the top just enough to display that I had just stepped over the line to pressure cooking. So proud of my pressure cooker! Brimming with ideas too. I stopped by the health food store to gather up some supplies for my first experiments. Instead of hauling my sack through the narrow aisles, I left it at the front of the shop, peering out at the people. "My new owner is not afraid!" it called to the patrons who furtively examined my purchase before continuing on in their meek health food directions. I was planting seeds. Planting seeds everywhere! One such aforementioned experiment would involve the beluga lentils question. A problem unsolved. 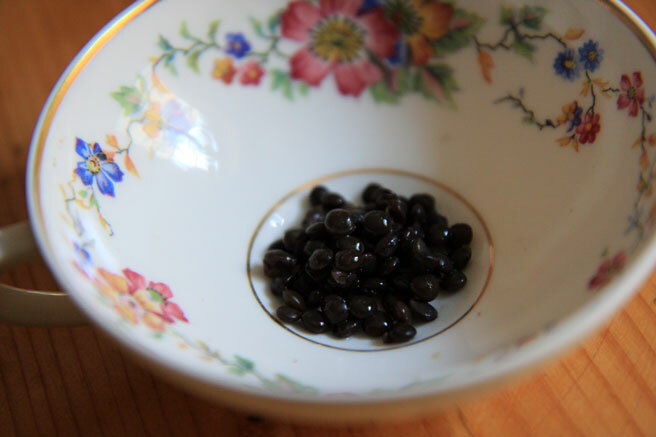 I love the whole idea of these little black lentils, but when you boil them for the alloted time, they always lose their rich dark color, fading to a tired grayish green. I wondered... What if pressure cooked? Ah, the sleekness. My new pressure cooker doesn't seem like it will explode at all! It has a very nice design and easy to clip on top, featuring a nice satisfying even modulated hiss when it gets going. Everything is very clear. The instruction manual was straightforward and easy. The lentils went into the cocotte, with the water, and in 8 minutes, I had a large mixing bowl full of rich dark colored fully cooked beluga lentils. I picked up a late summer pattypan, and sliced it into 8 large pieces. I aligned them like wedges of pie in the steamer basket, topped that with a link of fresh sausage, a sprig of rosemary, and two bay leaves. Steam time in the cocotte minute - 5 minutes. Dinner! The rosemary flavor infused into the squash, and with a drizzle of olive oil, the result was so flavorful it got me dreaming of what to cook next. I think I have discovered the secret of Lacombe's stuffed rabbit, come to think of it. They must give it a blast in the pressure cooker surrounded with fresh herbs. This is an idea I must try. When we make the rounds to visit family, I often carry my own knives: a cleaver, my beloved G2, and a simple Japanese vegetable knife. This frightens people that don't know me, and makes my loved ones laugh. I imagine now I'll also start carrying my cocotte minute on the road. They'll get used to it. Lucy, your perfect description brought back vivid memories of my mother's ancient (and frightening) pressure cooker. Mine is the next generation, similar to yours, but I haven't used it as much as I thought I would. Thanks to your encouragement that is about to change beginning today; I'm going to make a beluga lentil salad as part of dinner, and I'll be raising my glass to you. I hope you'll offer more suggestions for pressure cooker recipes as time goes on. Merci encore pour vos idées et vos encouragements! Lucy, I can relate to your story so much -- I was always terrified of the strange rattle on my mother's pressure cooker. But a couple years ago, I received a Kuhn Rikon cooker and my nervousness about pressure cooking disappeared after a few tries. This may be sacrilege to some, but I think the pressure cooker makes the most chicken-y tasting stock and a darn good risotto. An Italian friend told me her mother makes risotto with her cooker, too. You know, someone commented on the use of a pressure cooker to do poultry stock and I rejected that idea. I am set to mend my ways and give it a try. Beans, stock, soup, risotto. The pressure cooker can do it all very well and quickly. What's not to like? I am biased, though, since I teach pressure cooking classes. It's great fun and great food. haha, what a wonderful post. I felt like I could see your journey through the stores with your new best friend the pressure cooker. I am vicariously thrilled with your success as I have had thoughts about a pressure cooker before....perhaps I shall translate those thoughts into actions one of these days, I like the idea of using it for jams etc. The Beluga's look so gorgeous in that pretty, flowery eacup. Think I'd be lost without my pressure cooker. Especially in summer when, as you say, the heat makes a stove of bubbling pots the last thing one wants. So pleased you've jumped on board. I LOVE my cocottes minute. Yes, I have two, a squat Seb and a taller Kuhn Rikon. Also makes wonderful quick stock! However, for brown rice, nothing nothing nothing can surpass my Zojirushi rice maker. I've had it since last Christmas and absolutely adore it. i used to love caramel candy from condensed milc on the pressure pot... good old day!! I feel I'd need to pop a couple of mogadons if I had to approach a "PRESSURE cooker". La Cocotte sounds much more chummy. I've been wanting to get a pressure cooker for the longest time but have been afraid because of the exploding pressure cookers of the past. Good to hear that newer pressure cookers are less scary. A pressure cooker! I own one ever since I tried to cook artichokes in Bogota at 2800 m above sea level ... have had one around in all teh places where I lived thereafter .. and still cook my Brittany artichokes in one even if Paris is at sea level. I've been dancing aroung them for months myself... Same memories; same reasons. But our friend in Spain has one that he uses, successfully, all the time. The sales are still on - I may be ready to take the plunge. (Anything for those gorgeous Belugas... 8 minutes??? Oh, and Congrats on the purchase! OK.....You've convinced me. I own one, but rarely use it as a pressure cooker. I use it as a pot with a lid. (I don't snap it down.) But those lentils? That's a sale! Katie, dear, it's a SEB also sold as Tefal in other places. Still loving my pressure cooker! I used to be terrified of the pressure cooker, especially since my mother kept reminding me to be careful. Now, I have one of my own and love it, especially for pulses, potatoes and sometimes a stew when I don't have all that much time. I rarely cook vegetables in it, though, it's too easy to turn them into mush. That may be my Christmas present/new kitchen warming gift.